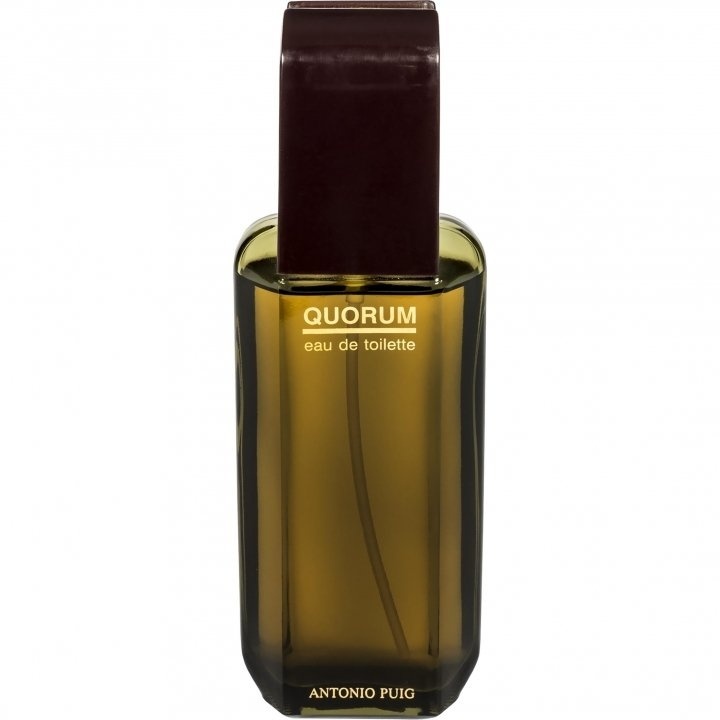 Quorum (Eau de Toilette) is a popular perfume by Puig for men and was released in 1982. The scent is spicy-leathery. It is still in production. Strong fragrance, woody, green, tobacco, leathery, spicy, soapy in the draydown. Same vibe of Anataeus from Channel but without the animalic note. Masculine fragrance for guys over 30's. Only to use in cold weather. Difficult fragrance in the opening: stong pine and oakmoss, but after 30 minutes you will love it, and the draydown is the best part. Great longevity and projection. One or two sprays is enough, more than can be dangerous for your reputation. Excellent relation price/quality. Any legal body must have enough members present before it can conduct its business; this what's known as a quorum. ...but in a good way. Quorum is powerful, dry, and smells like nothing else on the market from its time, nor like anything else today. It truly is a love or hate fragrance. Me, I love it, it is unabashedly strong, crass, and masculine. The cumin in the top adds a sweaty and dirty note to this fragrance. The tobacco and the frankincense add a smoky note to the leather. My impression of Quorum is that it smells like the classic bad boy with the leather jacket, and cigarette hanging from his mouth. He may be cleaned up but he's still aggressive and a little dirty. I think of Quorum that way; bad boy without the questionable hygiene and stale ashtray smell. Longevity is quite good. This stuff goes 12+ hours on my skin. Very strongly for the first 6. Go easy on the sprayer with this one. It is enough to clear a room if oversprayed. One shot on the chest after a shower is usually plenty. Its 80"s smell. It suits for older men 50 plus. Opening is strong Bomb but projection stays for 1 to 2 hrs n Longevity 4 to 5 hrs on skin. If u want to smell in 80"s style, This is for u. Its good.